International Day of Yoga was celebrated at VKV Tafrogam with great zeal and happiness on 21 June 2018. 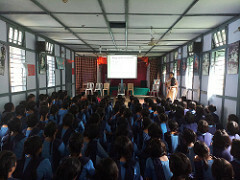 Two programmes were held at two venues. The PPT Presentation on the Core of Yoga was screened at 9am for the students, parents and staff. It was followed by elaborate discussions on selected points for the senior students and invited parents . The yogasanas were performed after a short relaxation period.warming up asanas,sitting asanas, suryanamaskar and pranayam were practised by 300 enthusiastic participants under the instructions of Su. Latashree Deo and Su. Rumi Khakhalari, the teachers of Vkv Tafrogam. The message of holistic approach towards health and inculcating a feeling of oneness through practicing Yoga could be successfully conveyed through this year's celebration.